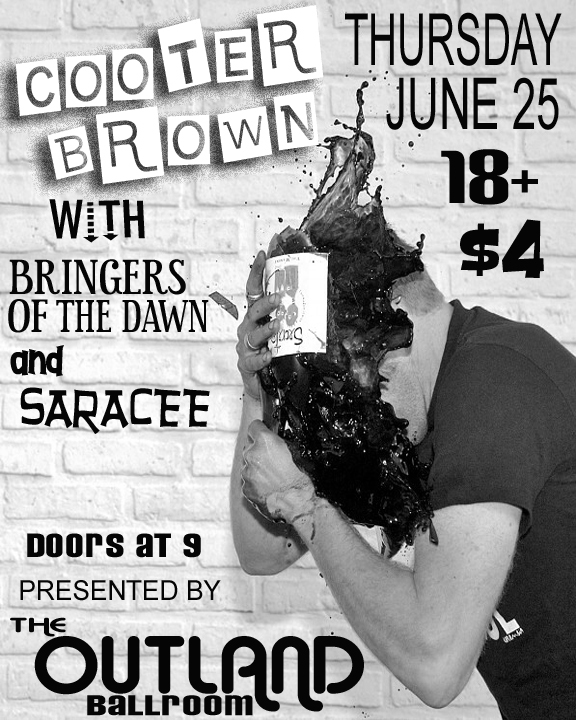 We know the Cooter Brown/Bringers of the Dawn/Saracee show tonight at The Outland Ballroom will be a big show and a good one, but the truth is it is just one of several very good shows going on tonight. We lead with their show because, well, they provided a visual aid, and we like it. The flier depicts a man smashing himself in the head with a large bottle, and it’s remarkably well captured. Alright, enough flier talk. Cooter Brown, in our show-going experience, has really come into its own in recent months, and they team up with two solid groups with slightly experimental approaches to their music. It should make for a good expect-the-unexpected time.